For us crazed weirdos who work in education – that's primary schools for me – I'll admit it was mildly encouraging to find our world was the main thrust of an Apple event this week. The updated, marginally cheaper iPad with pencil support isn't about to set hearts ablaze, but the mostly stable and reliable environment of iOS – and the bulk of education-focused apps – does make Apple's tablet well-suited in some ways to the demanding, fast-paced environment of a school. For music, animation, video editing and green-screening, iPads remain a high-quality package, and when children are engaged in such tasks, they're useful little tools. So why has the reputation of iPads in education taken a nosedive in recent years? The raw truth is that Apple hasn't been doing the essential nitty-gritty homework that our sector needs; it has preferred to spend its time – as ever – chucking glossy PR shots and sales noise our way. That stopped working as skint schools woke up to the fact that there are some shoddy, half-baked ideas and code lurking within Apple's confused glut of deployment software, and teachers became frustrated by the lack of simplicity for kids saving and retrieving work (note: Shared iPad, along with the just announced ClassKit and Schoolwork, might signal the beginning of the end for that particular wait, hopefully). Most adults understand that teaching groups of 30+ children in state education is demanding at the best of times – no doubt reason enough for many to avoid the profession entirely. Chucking a technology grenade into that mix is a heady and volatile experiment – if the tech isn't solid, quick, with settings primed and ready to go, a bout of spontaneous chaos is just moments away. There's no time to fix things on the fly - you may as well go back to candle power and get your favourite Roald Dahl out. So for technology to work en masse in schools, management of devices and teacher/student workflow need to be almost flawless. Unfortunately for education, iOS is clearly optimised for individuals; us lot managing sets of shared devices used by 5 to 11-year-olds are the second-class citizens in this game. What's even more frustrating is that many issues needn't necessarily be that hard to resolve – yet the impact when multiplied by 30 to 300 iPads is huge. If Apple really wants to take on the mighty Chromebook march, it needs to nail such small but highly disruptive concerns – some have been festering away for years now unchecked. I've seen many a network technician, fresh-faced and enthusiastic, enter the realm of school iPad deployment – "Ah, Apple, masters of user experience, deployment will run itself, right?" Months later they're spotted, avoiding iPad trolleys at all costs: dejected, bitter souls. Yes, Apple, you've brought along some improvements, but it's still a hideous hell-zone of calamities – all seemingly chugging along at a snail's pace on your development schedule. Hopefully the Apple education event was the sign of a wake-up call. It really needed to be. With built-in iPad storage traditionally not the most generous – students and teachers will get 200GB of free storage for iCloud accounts with the latest wave of Apple slabs - you would think a tick-box somewhere within the stack of iPad management software would enable the deletion of all photos and videos... on all iPads. But sadly no. Thus, schools limp along with crippled iPads full to the brim with children's selfies and videos – and no time-efficient way to get rid of them. iPad "privacy settings". The scourge of many a school technician. Apps want to know if they can use the camera, access the mic, photos, etc - and that's all fair enough. What's not fair enough is that these settings can't be forced into "on" or "off" through Apple's deployment options or a third-party MDM (mobile device management) solution. Bonkers, but why such a big deal? Well, young children tap "Don't allow" when an app asks them for a permission because they have no idea what the dialogue box is asking them. Scores of iPads need "fixing" manually because certain apps end up not being able to access the camera, or whatever else, any more. Apps sometimes don't even register the required setting and so need to be reinstalled. Update an app and – guess what! - the privacy settings disappear and will need to be summoned again for that app on each and every iPad. This reason alone has probably caused hundreds of teachers to think, "Well, I won't bother with those iPads then," and that's an understandable reaction when you've had a lesson fundamentally trashed from the outset; though of course the unfortunate teacher will only find out their lesson has been shafted after spending 20 minutes introducing the task. Printing. We've got teachers using third-party apps in order to combine nine photos on a page. Windows could do that by itself 20 years ago. I'm pretty sure users outside education might like to see that feature turn up in iOS too. Keyboards. We don't like your convoluted new layout, Apple, and would quite like a more colourful yet easy-to-read design for children please. Oh, can we force the setting in our MDM please, and mass-delete the emoji keyboard too? Children are rather good at making emojis look like talking turds, even before you sold us the idea. Deployment choices. For wired deployment, you gave us Apple Configurator 1 and 2 (with some technicians proclaiming that the first one remains superior when in fact they are both pretty flaky and crap). What do you mean app deployment sometimes only works on 10 out of the 30 iPads? Get back in there... unplug the updated ones... maybe come back tomorrow and see if it's worked properly. Teacher annoyed again? Oh. On top of all that, school tech departments must choose a third-party MDM for wireless deployment, because clearly Apple doesn't have the resources to create such a product itself. MDM companies seem to spend half their time chasing updates and bugs that Apple produces along the way. Liaising between an Apple School Manager account, an iPad app Volume Purchase Programme account and a third-party MDM console is a process that has driven many technicians to merry hell and back. 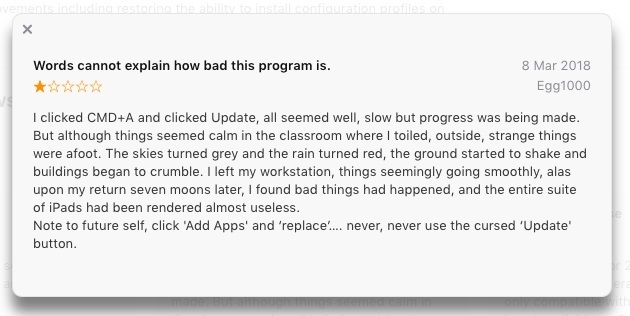 Furthermore, when apps were removed from iTunes, the trouble it created for iPad deployments was clearly not top of Apple's list of concerns. Plus, we lost some great software when iOS 11 got rid of 32-bit app support. "Sorry, Johnny, Apple updated iOS and your favourite storybook app doesn't work anymore." Smashing! "Shared iPad" – since releasing this feature way back in iOS 9.3, Apple appears to have caught up with itself and got the thing working as best it can with its Caching Service and iCloud accounts – now up to 200Gb of storage (instead of 5Gb) on each account, so that problem has been solved three years too late. Are any schools out there actually using Shared iPad or did everyone give up after the first few rounds of pain? Might it still be easier to stick a number on each iPad and get the children to remember which one they were using? The jury is still out on that one. If deployment issues are bad news, there are more fundamental acceptance issues too that Apple may struggle to overcome for some time. With the iPad bad vibes simmering along, there's a question-mark over whether schools can be convinced that a touchscreen interface will actually let children learn relevant skills for exams and push them on with traditional subjects effectively. Teachers themselves seem generally more comfortable with fixed keyboard devices, and the Chromebook juggernaut is showing a level of productiveness in classrooms not seen before. Its web-based device management console also appears to be generally well received by school tech departments, so it will be interesting to see how this one plays out. What should really be raising alarm bells for Apple, though, is that Google doesn't even appear to be trying that hard.